Sometimes it’s good to have a helping hand when doing some delicate slicing on your latest baking project. This nifty cake cutter wire is perfect for splitting cakes evenly, quickly and simply. With a height adjustable, carbon steel, wire blade to give a clean cut at any required depth, the frame also has stabilising feet to ensure a consistently level cut. View more from Pastry Tools, Cake Collection, Lesson Five: Assembly and Icing, For the baker and sweets maker, Gifts for The Baker, KitchenCraft Bakeware. 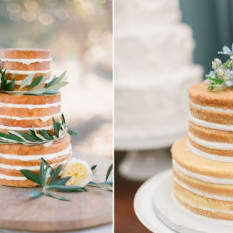 Perfectly even cake layers every time! An amazingly accurate cake slicer. Very simple to use, extremely accurate and one of the best baking tools to own. Before ordering this cake cutter, my cakes always looked very homemade. Slightly domed top, with buttercream icing slathered all over it - delicious, yes, but hardly food magazine worthy. Since acquiring the cutter, my cakes would make Martha Stewart proud. Decorating perfectly level cakes is much easier and the results look truly professional. I've been using the cutter to make birthday cakes for children's birthday parties and I never could have created such perfect cakes without it! I've had an instance where a cake had a particularly tough crust, so I used the wire to mark the height of where I wanted to slice and scored the cake with a knife to get the wire to grip. I find that a sawing motion works best to slice through a cake. To adjust the wire, press one end of the cutter against your chest and pull the other side (the other leg of the 'u') towards you to slacken the wire and adjust it. The Kitchen craft cake wire is a convenient, easy and hassle-free tool for cutting and dividing cake precisely. I was thrilled to find this item on Yuppiechef.com, been looking for it for a while. I was going to be making a rainbow Cake and knew from past experience that I couldn't be trusted with cutting any odd bits off with a regular knife. So off I went and picked up this little beauty! What a pleasure it was :) No fuss and a tiny bit of mess - love it! P.S - Thanks for the awesome rainbow cake recipe!! !